There are a staggering 1.9 million AIDS orphans in South Africa and by 2015 the figure will stand at 5.7million, according to UNICEF. Nearly a fifth of South African children live in orphan-headed households. African Solutions to African Problems (ASAP) a 501 © 3 in the US with an office in South Africa was started in 2003 to assist the women to care for the orphans and vulnerable children in their communities. The challenges of poverty and HIV/AIDS strip communities of their ability to provide well-rounded care for children. Since 2003, at the initiative of the East Woods School in Oyster Bay, New York, ASAP has been running ‘School to School’ – an innovative campaign that connects fund-raising school children in the USA with their counterparts in South Africa as beneficiaries. We believe that education is fundamental to a child’s welfare; how a child performs in school can be an important indicator of their overall well-being. School is potentially a community ‘safe place’ where responsible teachers can monitor vulnerable children. Children not enrolled in school are more vulnerable to neglect and abuse, and to developing and expressing anti-social behavior. The School to School Program was set up to provide school fees, uniforms, and basic learning materials to orphans and vulnerable children in the ASAP programs. East Woods School designed a strategy to help U.S. students find creative ways to raise money to provide funds for the neediest South African orphans and vulnerable children. Every child deserves an education, and every child deserves a chance to fulfil their dreams. Every year the women assess the children to see what item of school clothing they need. The outgrown items are handed down to a younger child in the community care centre. A significant impact was made in the lives of these OVC with the supply of school uniforms and shoes on their self-esteem, as these children can go to school without fear of being teased by other children for wearing torn clothes. The uniforms motivate children to go to school and this increases attendance records. Without these uniforms, many of these children would have dropped out of school. 100% of all School to School donations go directly to school fees, uniforms and learning materials. ASAP does not deduct any overhead or administrative percentage from monies raised through this campaign. Based on practical experience, ASAP has developed a 6-year dynamic Model and Strategy, which builds the capacity of emerging groups to provide broad-based care for Orphans and Vulnerable Children; access to education, nutrition, health and social services, psychosocial support and youth development. This model empowers women to establish a community care centre in rural areas to provide care for increasing numbers of orphaned children. In 2011 and 2012, Early Childhood Development (ECD) Training was conducted by 2 members from an ASAP funded Community-based Organization in Qwa Qwa, where there are 78 pre-schools with 5085 children. The teachers at Itekeng and Mamohau Drop-in center nursery schools had no information on programs and learning activities, and were not playing with the toys and books donated, because the teachers had no idea on how to use them. The basic objectives of the first training were to set up a well-organized educare program; to identify what material and activities participants can use in their centers and to make and improvise toys and equipment using scrap materials. They made a classroom layout and taught the teachers how children develop and learn through educational toys and through make-believe play. This is an on-going peer exchange training and at the end of the first module the participants had a basic knowledge of Early Childhood Develpment and the classrooms were transformed. Another training focused on outside play and story and music time, learning children’s songs, rhymes and games, as well as health and nutritional needs, and making educational toys. They learned how to handle the daily routines and how to keep administrative records such as the daily attendance register and fees register. There are 24,699 Public Schools in South Africa, 1,903 schools have functioning libraries with only 2.9% of schools in the Eastern Cape with a library. 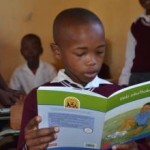 Although there has been a lot of talk around education and literacy by the South African government and the Department of Education, the establishment of school libraries and provision of library books remain in the domain of the private sector and Non-Government Organizations, like ASAP. In 2011, with the generous support of the Bradley Family Foundation, matched by ASAP donor funds, we installed libraries in two schools in the rural Eastern Cape, St. George’s Junior Secondary school (800 students) in Mt Frere and Maria Linden JSS (538 students) in Matatiele. 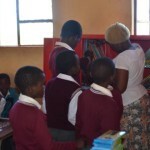 By getting the schools involved in the selection of books, which are aligned with the national curricula, they are now equipped with 2,000 books each to support their education, ranging from fiction to non-fiction, dictionaries and other reference books in both English and local languages. Installing libraries in the local village schools where we work, provides these isolated children with a chance to read in both their mother-tongue and English, thus laying a foundation of literacy to better their lives and escape the trap of poverty. In 2012, our research in the small local village schools, brought to light that due to overcrowding and scant resources, most of the schools do not have an extra room to allocate to a library. The schools near the community care centres where ASAP works, are very rural, under resourced and over-crowded and did not have the ability to allocate one room for their library. After discussion with the school headmasters and headmistresses and talking to other library organizations, i.e. Room to Read, it was determined that the best possible solution to get books into the schools, was to do individual classroom libraries. The school preferred that the books be 50% English and 50% Xhosa. Training on libraries would be done for the school on delivery of the books, two teachers from each grade would be trained. Three schools were identified and it was agreed that each school would receive 1500 books. 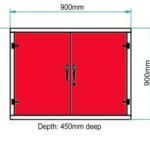 These books will be kept in each classroom in a lockable steel cabinet, for use in that particular class suited to that specific age and grade. 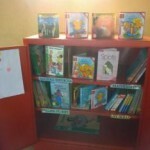 In November 2012, with the installation of the libraries, Pakama Ncume, our teacher librarian, who with her wide experience in school libraries, selected the books in line with the National curriculum. Pakama, who had previously trained the librarians at Maria Linden and St George’s, also organised a comprehensive series of three-day teacher/librarian workshops, for staff at each of the three schools. This created a platform for the teachers to get the best out of the libraries and promoted competent, confident teacher-librarians, to bring these books to life for the children, and to inspire a lifetime of reading. The topics covered included – the definition and importance of libraries, the roles and responsibilities of teacher librarians, book classification, library activities, the role of learners, their families and communities and making sure the library is fully resourced. Everything, in fact, needed to maximise the power of the written word in helping to transform these young lives for the better. And throughout, the teachers showed great enthusiasm and understanding of what was discussed, and a training manual was provided for future reference. 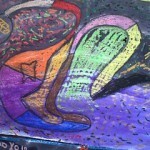 “Pakama is very good at what she does. We knew nothing but now we have an idea of what a library is. We would like to Thank ASAP for the libraries and the training that we receive”. This year at the drop-in centers we brought in Touch Roots Africa from Lesotho to equip the women with Psychosocial Support Skills so they are able to provide emotional and social support to the children. ASAP has employed a local Sotho woman who has had extensive training and experience working with psychosocial support through play therapy and storytelling, and is educating carers on how to help children cope with the loss of parents. In the training, the women found the session on ‘Helping children Understand Death’ an eye opener in that “they have been ignoring children because they assumed that children are not affected emotionally and were too young to be informed and be involved in bereavement and grieving when they lose their loved ones.” With grief counseling, children create a memory box in which to keep their memories or memorabilia of the person who has died. The Art holiday workshop kept the children in the drop-in centers busy and happy throughout the coldest school holiday, with snow on the Drakensberg Mountains. A brilliant creative art project for the younger children 6-13 years old, held at the Drop-in centers each school holiday. With 3 days in each center, the workshops encourage children to participate in interesting and enriching artistic activities. Many of the children have never used paints and Mandi brought fabrics and glitter and glues and the drop-in centers were a hive of colourful activity. 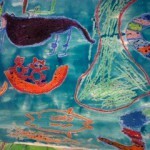 The children engraved images into wax crayon on paper and they loved how magical it was to transform an ordinary A4 piece of paper into their very own works of art. Learning about how to paint with both primary and secondary colours, they used toothbrushes, plastic bubble wrap, wool, string, straws and paint brushes. 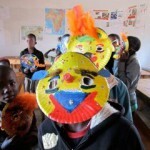 Presented with a treasure trove of interesting materials, the children also made their own masks. Creativity soared as they transformed wool and raffia into colourful locks of hair, and bottle tops and corks into noses. 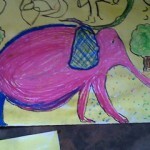 They also drew self-portraits to allow the children to reflect inwards. 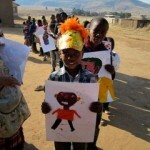 After looking in a mirror, the children drew pictures of their own heads and shoulders, and then added colourful and unique decorations to their work. © 2019 African Solutions to African Problems. All rights reserved. Site by Magine Media. Photography contributed by Mutuo, Jemal Countess and Ralf Stork.